Halloween Time at Disneyland is my favorite time to visit. 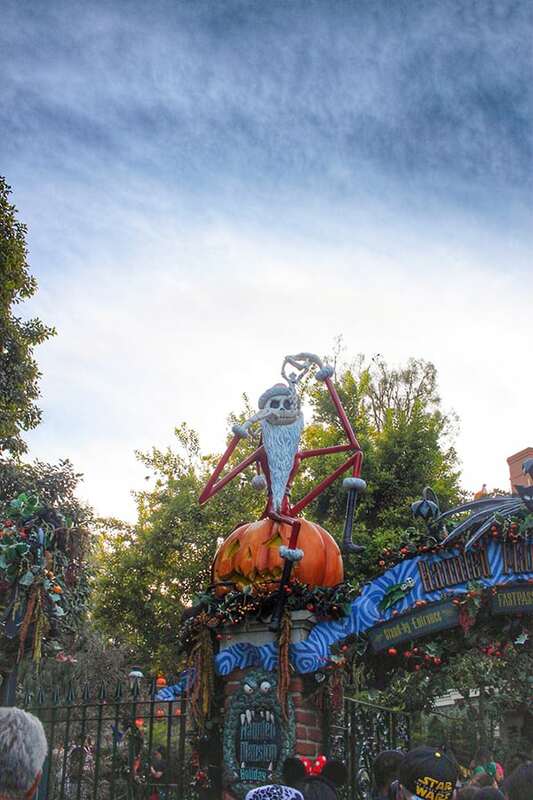 Of course, Christmas at Disneyland is completely magical, but there is just something so fun and quirky about Halloween. 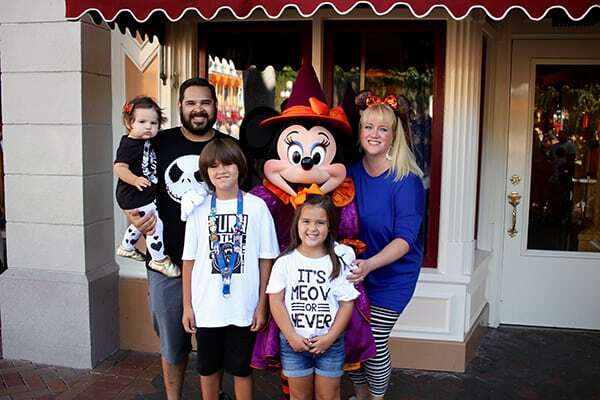 If you are planning a visit, or just love Halloween and Disneyland, I’m sharing some tips and tricks from our recent visit to Disneyland at Halloween Time and Mickey’s Halloween Party. If you are planning a visit, I highly recommend checking with Get Away Today for discount park tickets! If you use the promo code Pencil, you can save $10 off a Southern California vacation package when you book with them! 1. 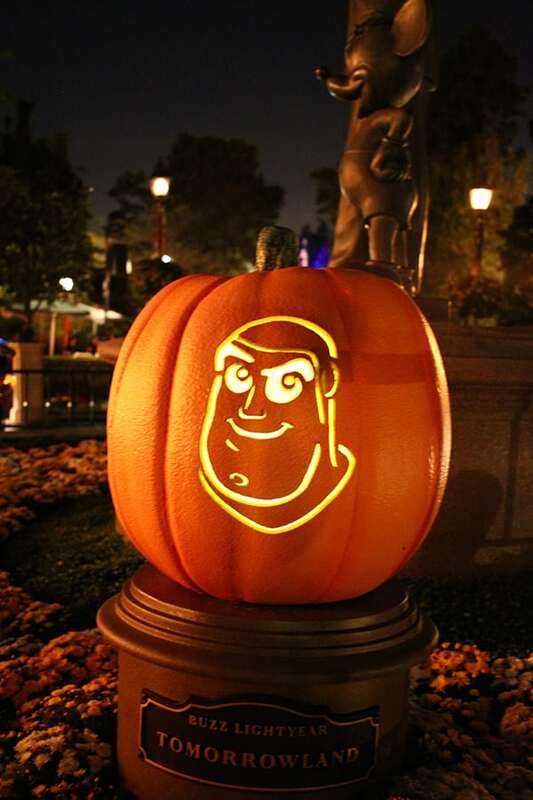 The Great Pumpkin – Halloween Time at Disneyland begins in September and runs through the day after Halloween. Disneyland’s Main Street is where you can find most of the Halloween decor. This adorable Mickey Jack O Lantern is the centerpiece, and everyone lines up here for a family photo opp. 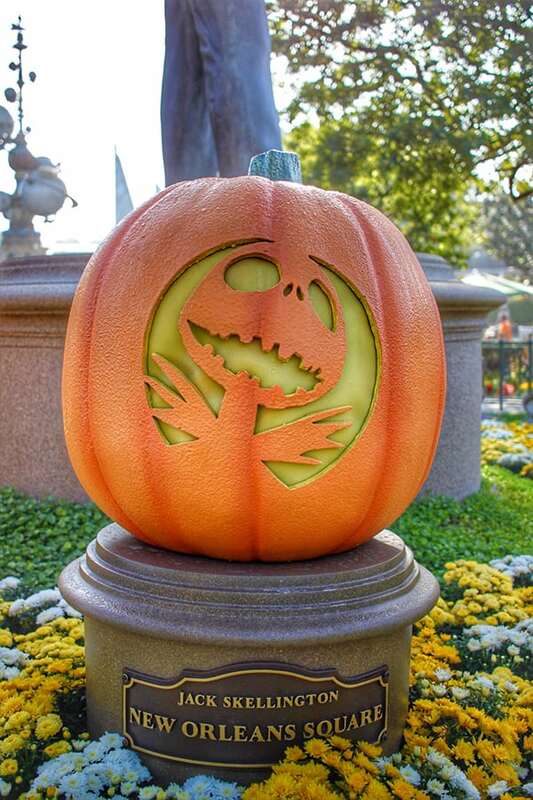 There are Cast Members taking photos on both sides of the pumpkin, so check which side is the shortest. Most often it’s the opposite side of this picture. You can find the shortest lines for a pumpkin picture first thing in the morning. Mickey’s face is different on both sides, so make sure you check them both out! 2. 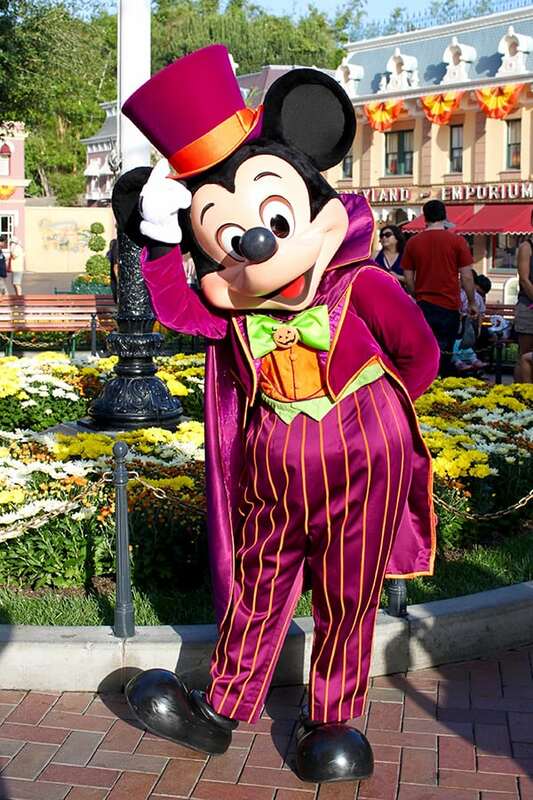 Mickey the Magician – Mornings are also the best time to meet this guy and his friends! Download the Disneyland app before your trip. You can find the character appearance schedule on the app, which makes it so much easier to plan a meet and greet! Between 8 and 9 in the morning we were able to see Mickey, Minnie, Donald and Goofy, all in their awesome Halloween costumes in town square. 3. Start your day early. First thing in the morning most people are rushing for the popular rides, so it’s an ideal time to get some great pictures. If you want to do rides first thing, which is a great stratgey as well, the characters will be back probably around mid afternoon. Check the app so you can plan your day accordingly! 4. 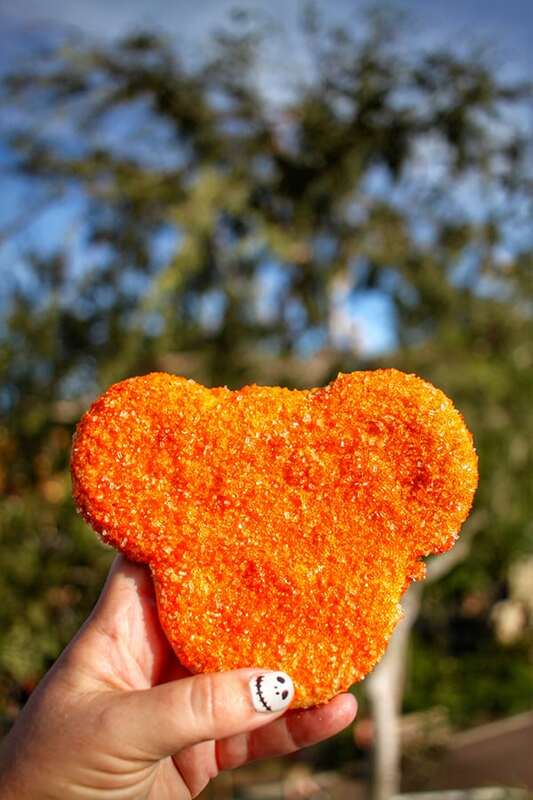 Pumpkin Beignets – Mickey shaped pumpkin biengets make an amazing breakfast! Delicious pieces of freshly fried dough, this is one of my must-have treats during Halloween Time. 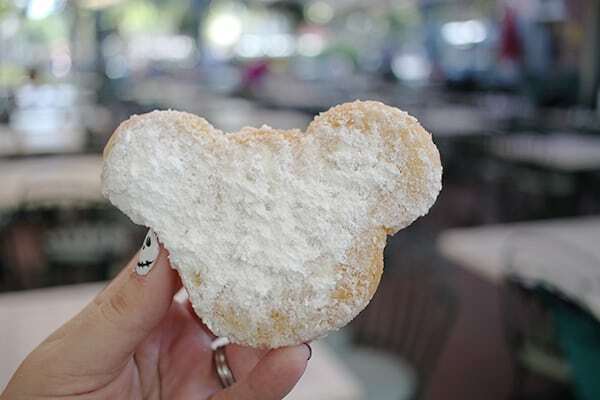 If you head to New Orleans Square, you can buy a bag of pumpkin beignets and a coffee from the Mint Julep Bar to start your morning off right. Be prepared to make a mess on your shirt with all the powdered sugar, but it is so worth it! 5. 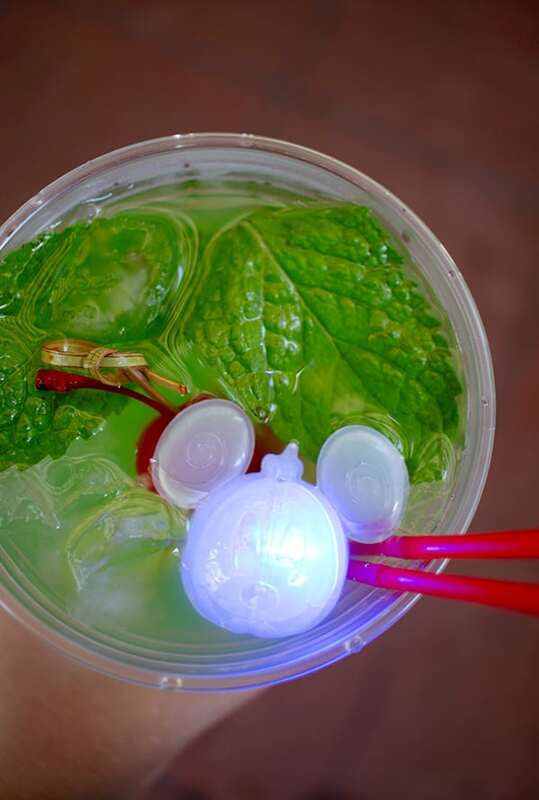 Halloween Glow Cubes – While you are at the Mint Julep Bar, add one of these fun glow cubes to your drink. You can buy these at different locations all over the park. They also offer a cute poison apple glow cube! The poison apple souvenir cups are also one if the hot items this year. We grabbed one on our first day at the park, but were told they were sold out that weekend but expecting more soon. We did spot some over at the Cove Bar at California Adventure on Sunday, so it may be worth checking around if you can’t find them right away! 6. 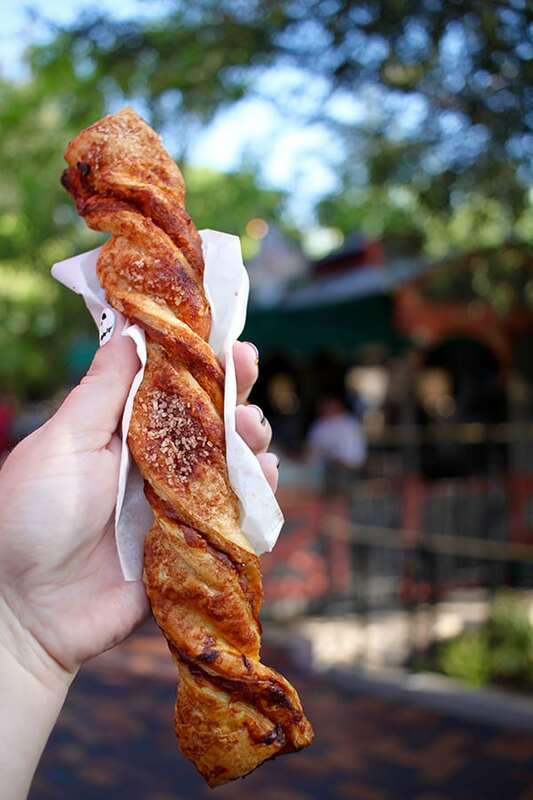 Pumpkin Twists – These delicious pumpkin pastries can be found at the Maurice’s Treats cart in the Fantasy Faire area. These make a delicious on the go breakfast. 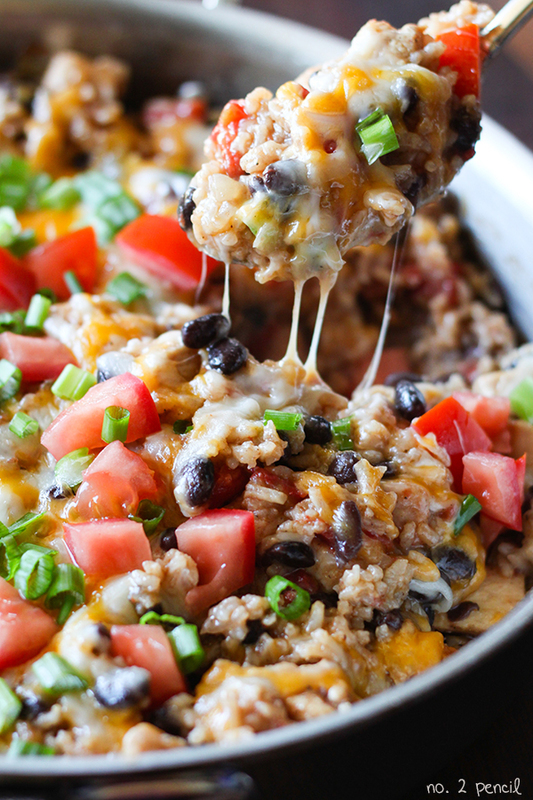 Pairs perfectly with a pumpkin spice latte! 7. 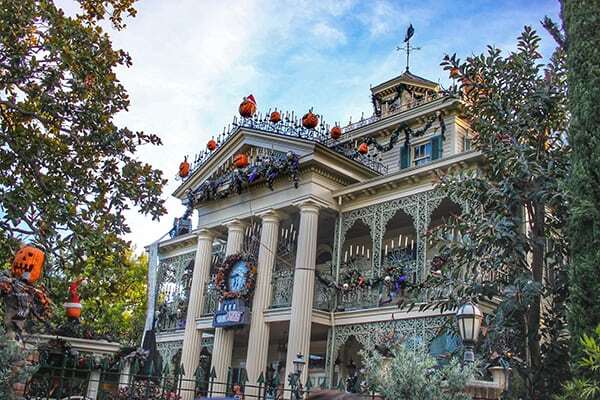 The Haunted Mansion – Halloween Time marks the return of the Haunted Masion Holiday where it is completely decked out with The Nightmare Before Christmas decor. Soak up all the fun details on this ride! Make sure to keep your eye out for the Hat Box Ghost, newly returned to the attraction, and the gingerbread house display, my personal favorite! 8. Fast Pass – During the Haunted Mansion Holiday, Disneyland offers Fast Passes for this attraction. The demand for the ride is really high during this time, so a Fast Pass is your best bet to avoid waiting in a long line! If you are at the park early, you can probably hop right on, but I would still recommend getting a fast pass for this attraction and visiting popular attractions that don’t offer fast passes first thing in the morning. Space Mountain Ghost Galaxy is the other hot attraction for Halloween. Ghost Galaxy can be a little bit scary for younger kids. Fast Pass is also recommended for Space Mountain Ghost Galaxy. 9. 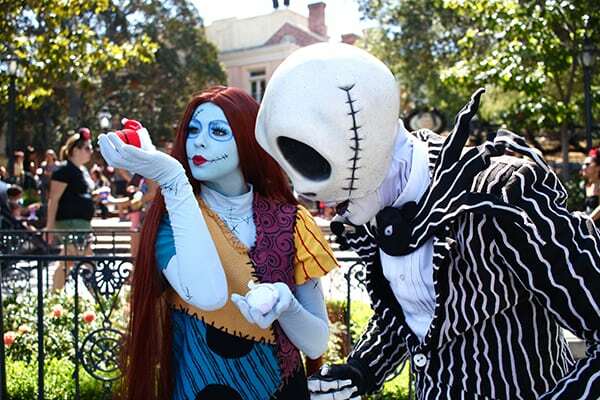 Meeting Jack Skellington and Sally – Jack and Sally are probably the most in demand meet and greet at Disneyland during Halloween. They are only out three months out of the year, so the lines can get really long, but it is completely worth the wait. My best tip is to check the Disneyland App to see when they will be appearing. Cast Members will not allow you to form a line ahead of time, so just relax and hang out in the area and be ready to form a line when they appear. 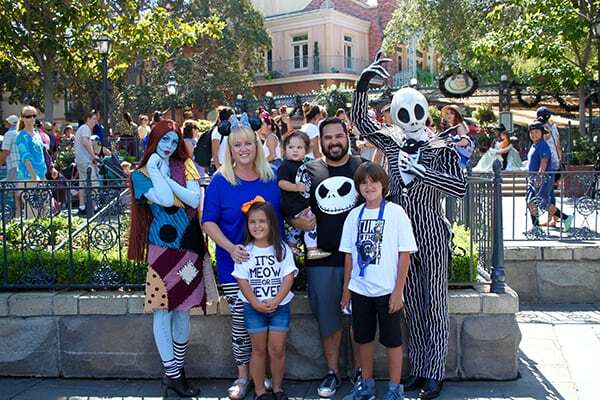 Our kids brought their Nightmare Before Christmas Tsum Tsums to show Jack and Sally and they had a lot of fun talking to them about the Tsum Tsums. 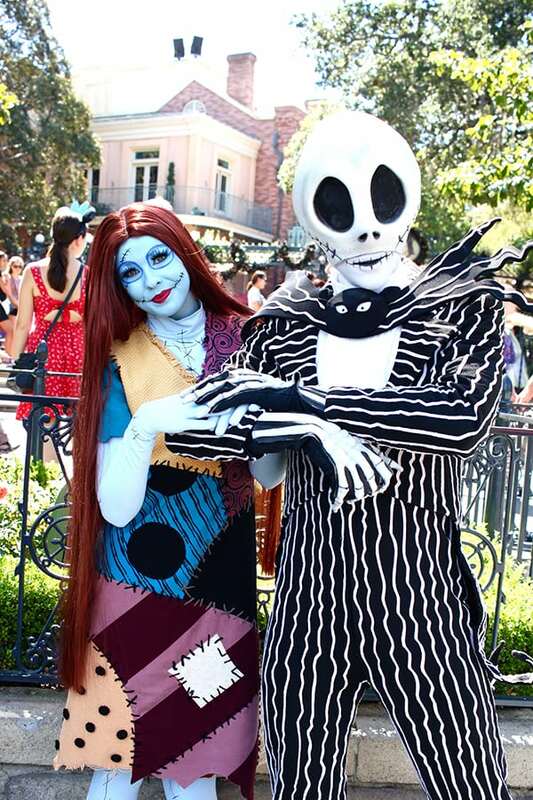 Jack and Sally spend a good amount of time talking with each guest, so bring your patience and be kind to the Cast Members and guests around you. It helps to grab some snacks and enjoy them while you wait! 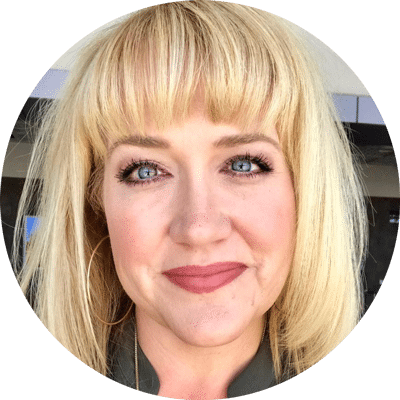 Keep reading for some of my favorite suggestions! 10. Halloween Sugar Cookie – This sugar cookie was one of my favorite treats! Soft in the middle with a yummy sugar crust. It has a very light citrus note that is just delicious. I picked this up at the Jolly Holiday Bakery on Main Street. 11. 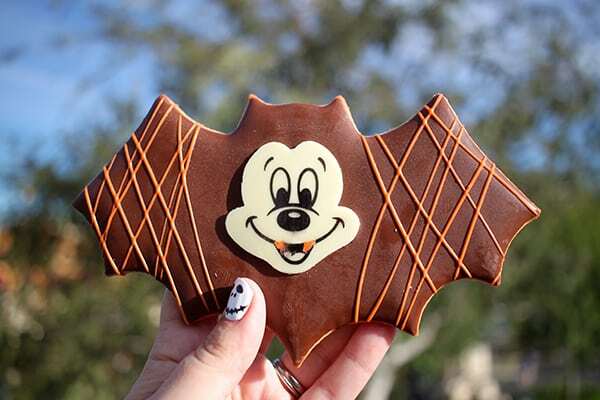 Mickey Bat Cookie – The cutest Halloween cookie around is a must-try at Disneyland! These make great gifts for friends at home too. Just don’t let them get too warm, the chocolate will melt. 12. The Halloween Tree – over in Frontier Land you can find the iconic Halloween Tree dedicated to Ray Bradbury. 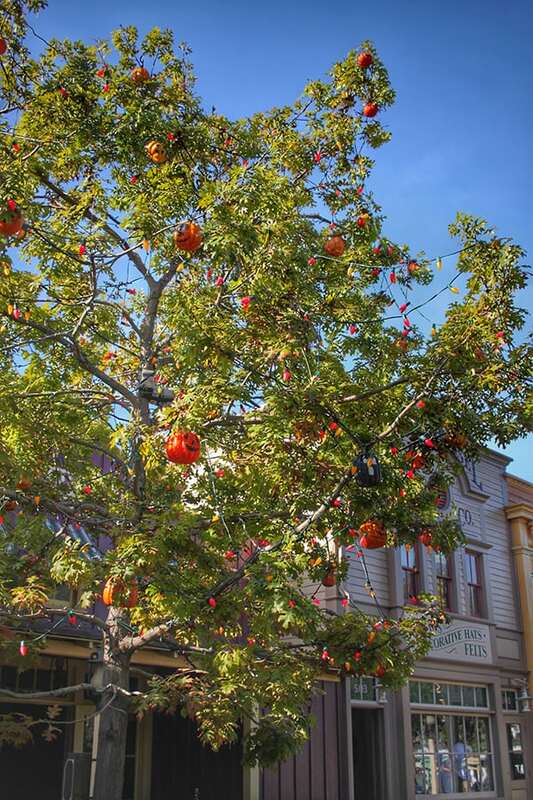 You can read a bit about the history of the Halloween Tree on the Disneyland blog. Make sure to visit it a night as well, it’s especially beautiful all lit up! 13. 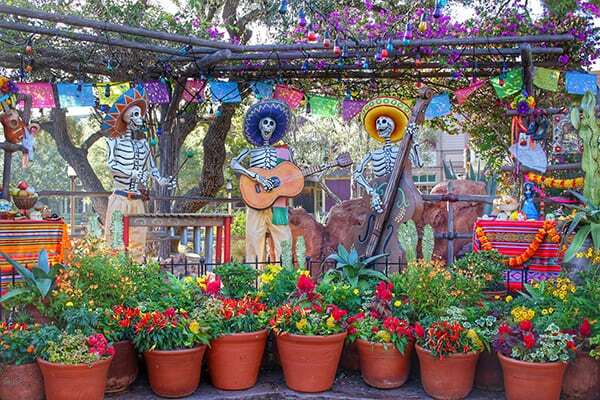 Dia de los Muertos – Not far from the Halloween Tree you can find Disneyland’s tribute to the Day of the Dead. I just love these colorful decorations. 14. 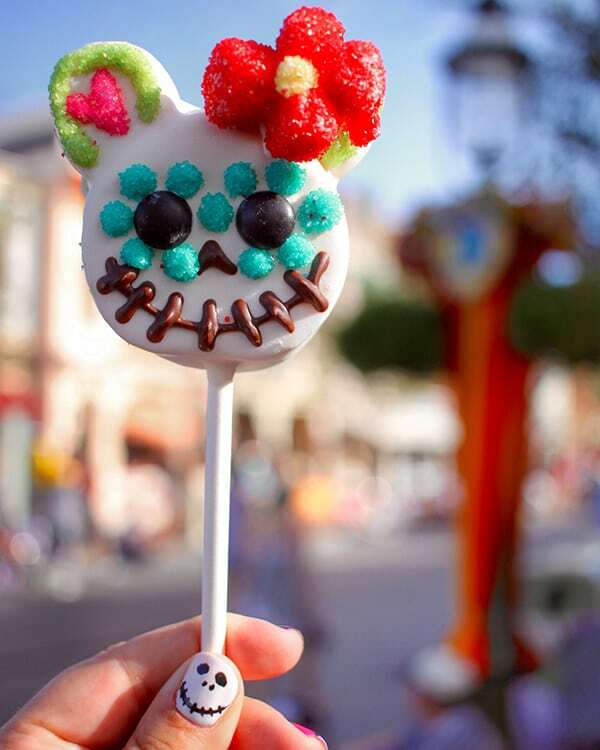 Dia de los Muertos Treats – through out the park you can find these beautiful sugar skull treats! We spotted caramel apples, crispy treat pops and my favorite, cake pops! They had both Minnie and Mickey versions. The cake pops are one of my favorite treats at the park! Not only are they adorable, they are delicious too. 15. Caramel Apple Poison Apple– speaking of beautiful treats, this caramel apple Poison Apple is killer! The holiday caramel apples are always some of my favorite treats to buy because they are so creative! This poison apple has to be one of my all-time favorites! We also spotted a fun Mickey Pumpkin head caramel apple and an awesome Maleficent caramel apple. 16. 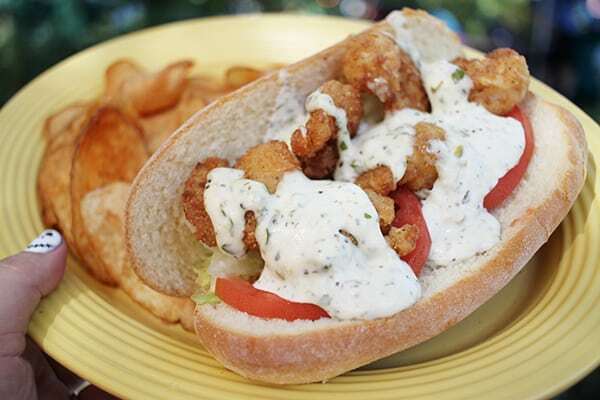 The Traditional Shrimp Po’ Boy at the French Market Restaurant – this limited-time Disneyland eat is delicious for lunch or dinner. The popcorn shrimp was crunchy and fresh and the creamy Cajun remoulade on top was delicious! 17. 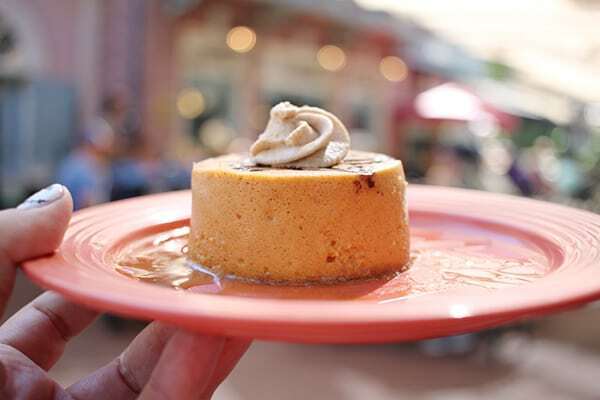 Pumpkin Cheesecake – While you are at the French Market Resyeraunt, pick up one of these pumpkin cheesecakes. Creamy and delicious with a lot of pumpkin flavor! You can also get one at the Jolly Holiday Cafe. 18. Big Thunder Ranch – Keep going past Big Thunder Mountain and you will find Big Tunder Ranch. This soon to close area is decorated for the last time for Halloween. 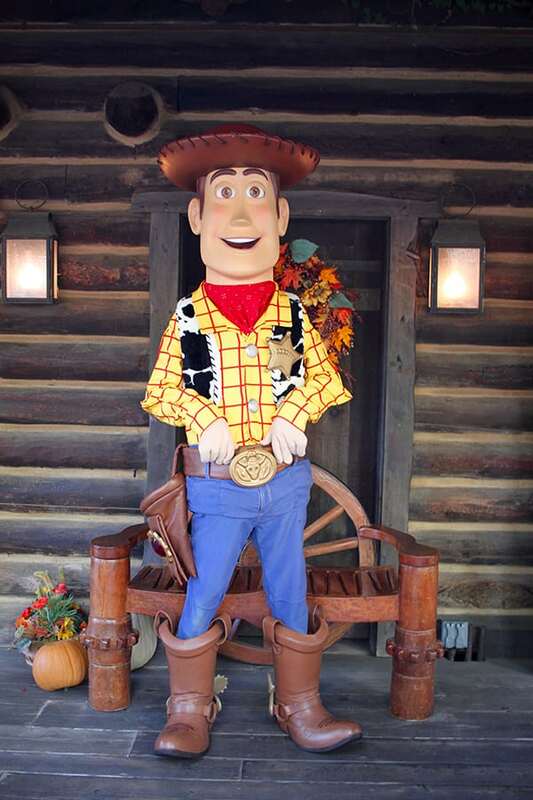 We found Woody back here during our visit. I’m sad to say goodbye to Big Thunder Ranch and the Disneyland goats, but beyond excited for Star Wars Land! If you can snag a table at Big Thunder Ranch BBQ, you can eat one of our favorite meals at the park before it closes permanently to make even more room for Star Wars Land. 19. 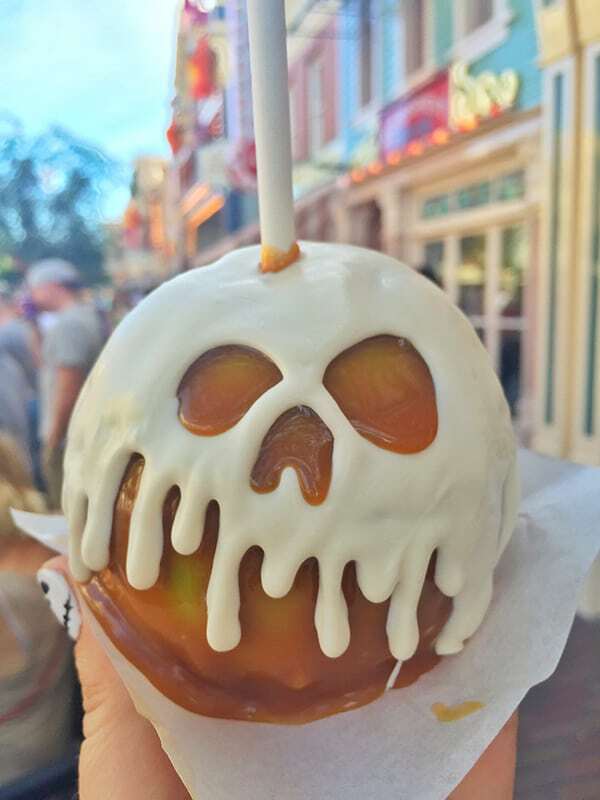 Complete Halloween Eats Guide – There are so many Halloween treats and eats at Disneyland and I wish we could have tried them all. You can find the complete list here on the Disneyland blog. We had a late dinner at Cafe Orleans before we hit the road and were able to sample the Flat Iron Steak and it was delicious! They also offer the pumpkin beignets at Cafe Orleans. This is my favorite place to order them because they come with a delicious vanilla creme dipping sauce! 20. 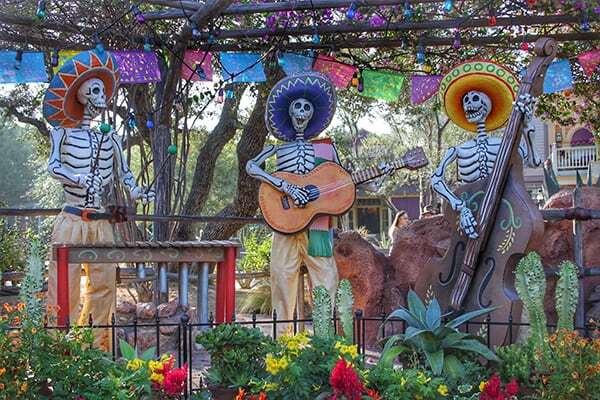 It’s all about Disneyland – Although we absolutely love California Adventure and especially Cars Land, all the Halloween theming is at Disneyland. So, if you are only visiting for one day and want to focus on Halloween Time, you can probably skip the park hopper passes. 21. 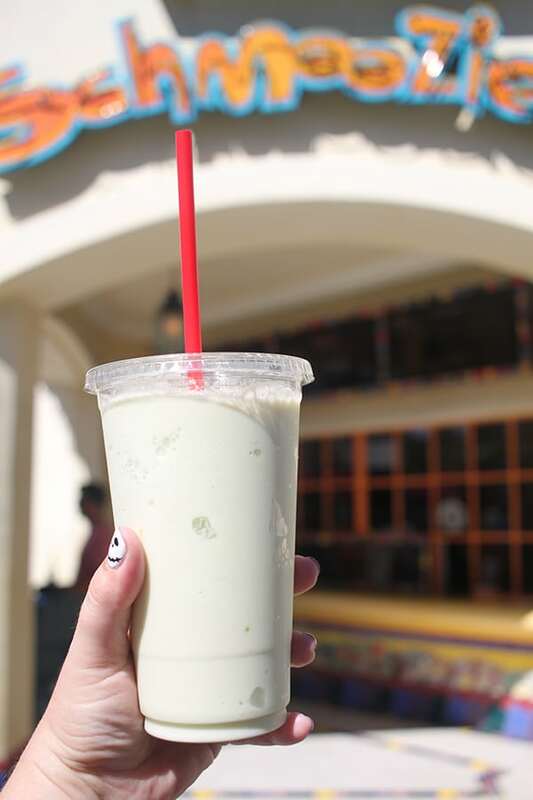 Caramel Apple Smoothie – I did find one of my favorite Halloween Time treats over at California Adventure though! This smoothie is delicious and it was perfect for the super hot weather we were having that day! The caramel sauce and fresh apple chunks in this icy treat were perfect for beating the heat! 22. Where to Stay – If you will be staying a night or two (or three! ), check out the Ramada Maingate at the Park. This is one of our favorite places to stay. You can read my review here. It’s right across the street from the park and the pool is perfect for the kiddos. Temperatures were close to the 100 degree mark during our visit, and we were extremely grateful for the pool! 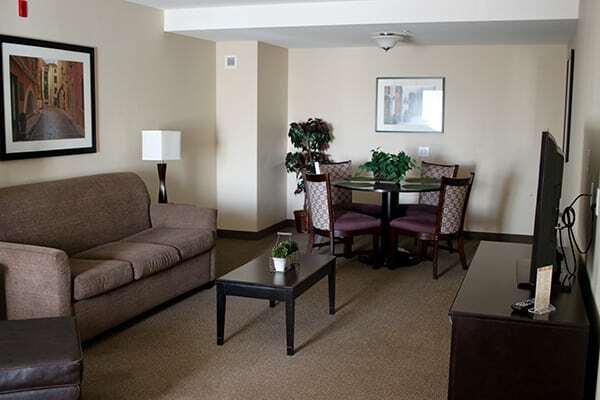 The Ramada Maingate at the Park was kind offer to offer us a two-night stay during our visit in one of the family suites and I cannot recommend it enough! It was heavenly having two rooms! 23. 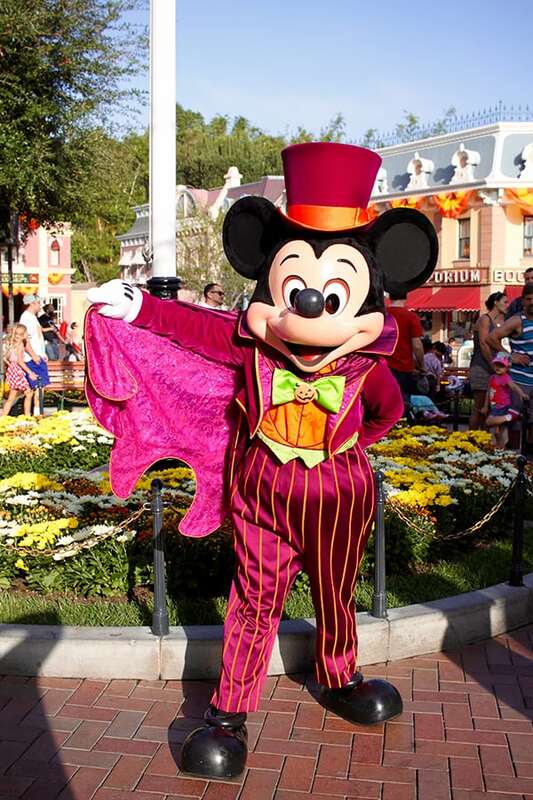 Mickey’s Halloween Party – Mickey’s Halloween Party is a separate event that runs at Disneyland during Halloween time. You must purchase tickets in advance to attend Mickey’s Halloween Party. 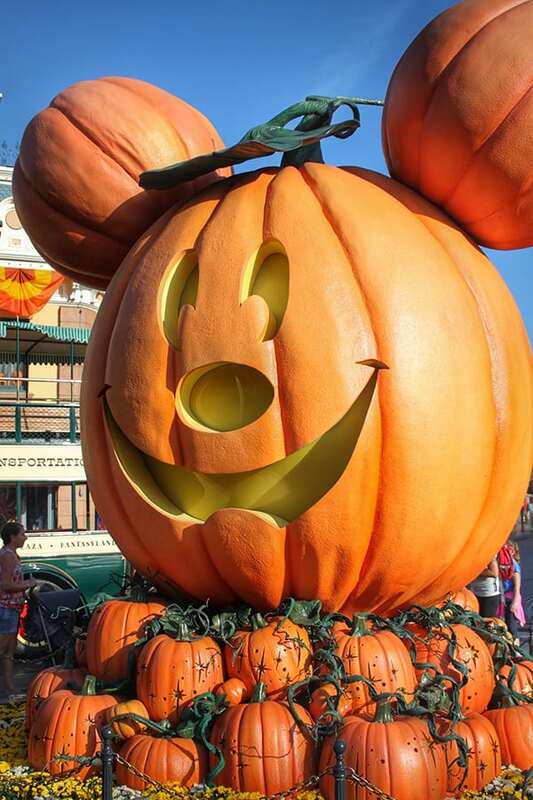 If you are visiting Disneyland during Halloween Time, but not planning on attending Mickey’s Halloween Party, make sure to check the park schedule. Disneyland closes early on certain nights for guests not attending the party. 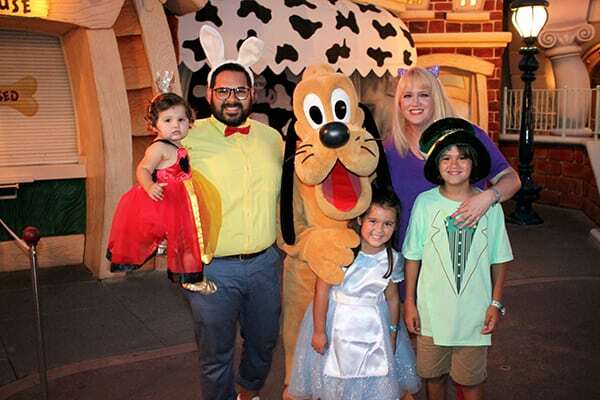 Our family has partied at Mickey’s Halloween Party for the last three years, and it’s one of our favorite times at Disneyland! Stay tuned for a seperate post on Mickey’s Halloween Party! Don’t forget to check with Get Away Today for discount park tickets! 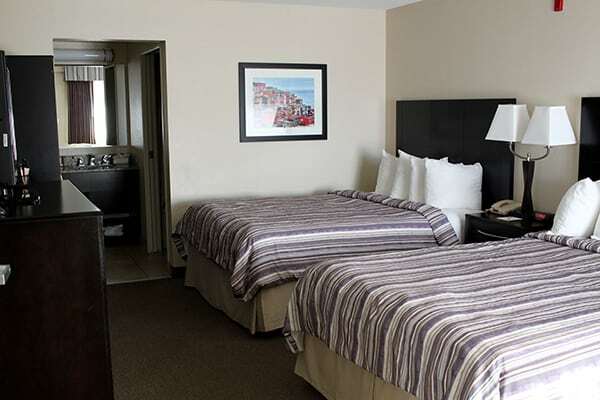 If you use the promo code Pencil, you can save $10 off a Southern California vacation package!